History is more than dates and places. As interpreted by Radio Diaries, history lives within people. It's the voices of individuals -- ranging from politicians to ordinary citizens -- that bring the history of South Africa to life. A striking mix of archival materials and contemporary reminiscences. 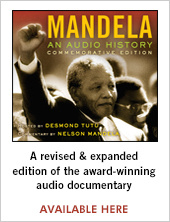 Mandela: An Audio History is a 5-part radio series documenting the struggle against apartheid through rare sound recordings, the voice of Nelson Mandela himself, as well as those who fought with him, and against him. Mandela: An Audio History has been heard around the world on NPR, BBC, CBC, SABC, and is winner of the duPont-Columbia Award, considered the Pulitzer Prize of broadcasting. "Mandela don't let the whites undermine us. Help! People are dying. We sleep in the mountains." The series was funded by The Corporation for Public Broadcasting. Many, many thanks to all those who helped along the way: Chris Turpin (NPR), Angie Kapelianis, Teal Krech, Gail Berhmann, Angus Gibson, Dr. Nthato Motlana, Ahmed Kathrada, Allister Sparks, Zindzi Mandela-Hlongwane, Ilse Assman (SABC), Bernie Jacob (SABC), Bernard Monayi (SABC), Mike Roberts (SABC), Dawna Swinton-Diggs (CPB), Jenny Schmidt, Jason Beaubien, Lucinda Englehart, Phyllis Richman, Rick Stengel, Jo Menell, Tom Karis, Brian Tilley, Cliff Bestall, Sharon Gelman, Ann Cooper, Sandy Rattley, Stephen Smith (American Radio Works), Pieter Ferreira, David Fanning, John Matisonn, David Goldblatt, Indra DeLanneral, Elinor Sisulu, Graham Goddard, Zolile Mvunelo, Tshepo Moloi, and Christo Brand.